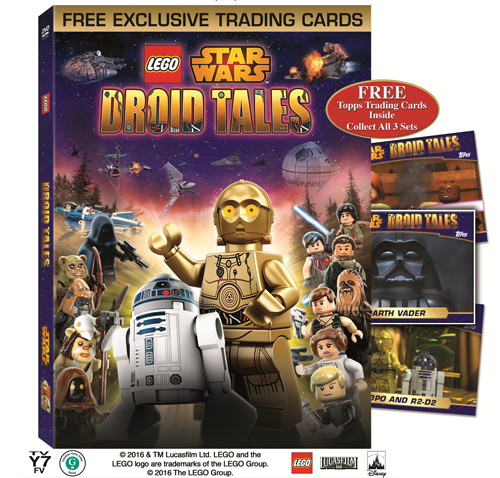 Win LEGO® STAR WARS: Droid Tales on DVD! You could say that I’m a big fan of Star Wars, but that might be a bit of an understatement. I LOVES ME some Star Wars, and I have ever since I first saw “Star Wars” (now Episode IV) in the theatre as a kid. And while some people may think that things have gone a little Spaceballs with the *Merchandising! * that accompanied the release of Episode VII, there is more than a little joy in my heart to see new Star Wars stories told on screens of all sizes. So, when Disney asked me if I wanted to host a giveaway for the latest offering–LEGO® STAR WARS: Droid Tales–I was all in. Over the winter holiday break, I helped dd put together the LEGO® version of Kylo Ren’s Command Shuttle and it was SO much fun. I just really adore the pairing of LEGO® and Star Wars. And now, the fun stuff: Who wants to win a copy of this fine show on DVD? The story starts up just after the end of Episode VI (Return of the Jedi), with the celebration on Endor. As so often happens with the droids, hijinks ensue and–instead of just telling the story of what led up to Episode I (The Phantom Menace)–the droids end up giving their version of the entire saga from Episode I through Episode VI. Disney has ponied up FIVE copies of LEGO® STAR WARS: Droid Tales on DVD! Each DVD comes with an exclusive set of trading cards, so there’s even more collectibility baked into each item. Enter using the Rafflecopter below. Oh, and please: U.S. Residents ONLY. * I’ll notify winners very soon after the giveaway ends, and each winner will have three days to respond with their mailing address so I can get it to Disney for fulfillment. *The U.S. resident requirement is related to the fact that I’m trying to avoid any potential Customs issues. Please know that I love my fellow global residents, and please don’t take it personally. Not all of us think that we need to build walls. THIS CONTEST IS OPEN TO U.S. RESIDENTS ONLY. General rules: follow the rules and everybody gets along nicely. You earn entries based on your participation via the Rafflecopter widget, and this giveaway runs from 12:00am ET on Thursday, March 3, 2016 until 11:59pm ET on Tuesday, March 8, 2016. Only valid entries received during that timeframe will be considered legitimate. Anyone who commits fraud or tries to screw with the system, game the system, or otherwise not play nicely will be removed from consideration. Check “Wheaton’s 1st Law” if you want to understand where I’m coming from, folks. Five winners will be selected and each will receive a DVD, which will be mailed to the address they provide following notification of their winning status. Winners will be notified by email within 1 week of selection and MUST supply a valid U.S. mailing address within 3 days of being notified. This blog is sponsoring this giveaway, which was kindly donated by the folks at Disney. I did not receive anything from Disney in exchange for hosting this giveaway other than a WHOO HOO THANKS SO MUCH email. I’m nice like that. Also, the fine folks at Twitter and Facebook are not sponsors of this giveaway and have no stake in it whatsoever. Play nice, enter often, tell your friends, and may the force be with you! This entry was posted in giveaways and tagged droid tales, giveaway, lego, star wars by crunchymetromom. Bookmark the permalink. Rafflecopter and I don’t always get along but here’s my good faith attempt to leave a comment. Favorite character? I can only pick one? Prior to December 2015, I’d have said 3PO, but it’s all Rey all the time now!! Rey is such a badass…love her!!! Princess Lea because she’s strong. Yoda is my favorite love his wisdom . Chewbacca is my favorite because he is so funny and looks so cuddly.